2 FREE EXCLUSIVE PRODUCTS only available with the purchase of the bundle! 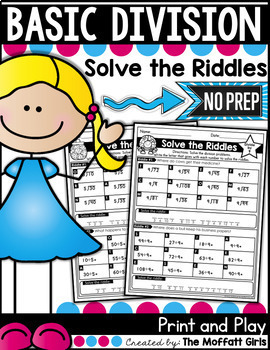 Once students have practiced their math facts with the other portions of the bundle, it is time to show mastery! The Timed Tests packet offers two different sets of tests so that students can work up to a 100 question test! *The first version is a weekly test. Each day, the students take a quick 25 questions division test on one divisor. They practice the test every day while trying to improve speed and accuracy. The second version of the test is a 100 question test! For this version, there is a focused divisor and review tests. The most effective results to these tests will come after students have practiced their division facts with other parts of the Division Bundle. *Make learning your multiplications facts a game! Each page focuses on a specific divisor and/or a review. *Roll a die and solve a division problem in that column. Race to the top to see who wins 1st, 2nd and 3rd place. 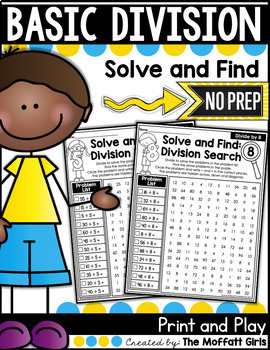 Division- True or False is a fun, hands-on way to work to master division facts. Students cut and paste the answers under the correct column (true or false). Each page will focus on one divisor. There will be 8 true and 8 false equations. Division Searches are a FUN and effective way for students to work on mastering their basic facts! *Each page focuses on one divisor to be divided or a mixed review of several numbers. *Students begin by solving the problems on the problem list. *Next, students find the division problems in the search. When they find the problem, they circle/highlight it and add a ÷ and = sign. *Once they find the division problem, they check off the box. *In set 1, students spin the quotient and fill in the problem. *In set 2, students spin a dividend and fill in the problem. The player who has the most answers, wins the game! Tic-Tac-Toe Division is a fun way for students to practice basic division facts. This game is played just like the traditional game of tic-tac-toe but with division facts. *Each player uses a different colored game piece to mark their choice. Students must solve the problems correctly to place their piece on the board. Three is a row wins the game! *Each game board focuses on a specific divisor or a review of divisors. In addition, each game board allows students to work/see division problems two different ways. Spin and Divide is a fun way to practice basic division facts by using a spinner. Each page focuses on one specific divisor. *Students use a paperclip and a pencil to make a spinner. Place the paperclip and pencil in the center of the spinner. Flick the paperclip to create the spin. 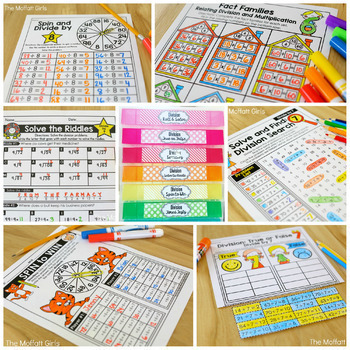 This simple, yet fun and engaging activity, allows students to practice 30 division facts on each page. Solve the Riddles by answering the division facts. 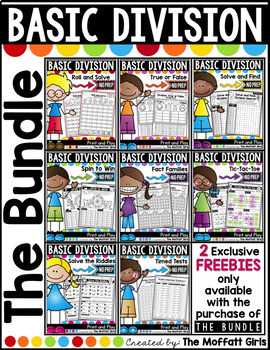 *Each page allows students to solve the division problem vertically and horizontally. *The first version is a weekly test. Each day, the students take a quick 25 questions division test on one divisor. They practice the test every day while trying to improve speed and accuracy. The second version of the test is a 100 question test! For this version, there is a focused divisor and review tests. The most effective results to these tests will come after students have practiced their division facts with other parts of the Division Bundle. These fun and bright labels are a perfect way to enhance your division container drawers.